Salesmen -- not women -- are in growing demand at local cosmetics stores. Industry insiders agree that they not only appeal to female customers, but can also serve male shoppers better based on their own experiences. As such, the cosmetics industry is increasingly resorting to them as marketing resources. "Most [high-end] brands get their male employees to do a makeup demonstration as female customers prefer it. And in that way, it's easier to induce them to open their wallets," said beauty consultant Pi Hyun-jeong. "Male salespeople tend to pay special attention to their hands, as rough hands often drive customers away. They even do manicures, which normal guys show little interest in." A source at a cosmetics company said that Korean men's growing interest in personal grooming is also a factor behind the rising demand for male salespeople at stores. In many cases, men have been hired simply because of their gender, he added. 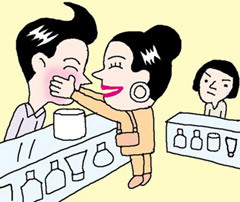 The trend has also been observed in stores selling cheap cosmetics products. "Men seem to feel more comfortable buying grooming products in budget stores than in department stores. So stores are hiring an increasing number of male salespeople to respond to this new customer demographic," said a staffer at a budget cosmetics brand in Seoul. "They are also very helpful as products need to be replaced more often in budget stores and they can help with the heavy lifting."